(Newser) – You know what they say, bros before strategically important Senate seats. Marco Rubio tells CNN he'd consider running for reelection to the Senate if only his "real good friend" Florida Lt. Gov. Carlos Lopez-Cantera wasn't already running for the seat. "I think he's put in time and energy to it, and he deserves the chance to see where he can take it," Rubio says. 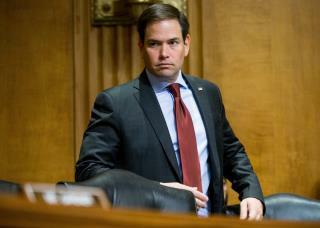 Since launching his failed presidential bid, Rubio has said he wouldn't be running for reelection to the Florida seat. “I have only said like 10,000 times I will be a private citizen in January," he tweeted recently. But MSNBC reports Republicans have started an "organized effort" to get him to change his mind. "Very well, if that is the way the winds are blowing, let no one say I don't also blow"
Trump is an unqualified jerk! Knowing this, anyone & everyone that thinks he should be POTUS is a bigger jerk!!! Rubio is a tool of the Koch brothers. Hope Alan Grayson (Dem.) wins his seat.